The 18 passenger minibus is the perfect solution for small groups who can’t be split up easily on public transportation or rideshare apps and who don’t need a full-sized charter bus. Use this compact, yet comfortable bus to shuttle groups for weddings, corporate events, or around town. Chicago Charter Bus Company can help you find reliable transportation for your wedding, corporate event, sports team, school event, and more. Call our 24/7 reservation specialists at 312-667-0906​ to start our fast and easy booking process. Book a 25-passenger minibus to accommodate your medium-sized group on your travels through Chicago and beyond. You can avoid having to split your group into multiple cars, and you can enjoy premium amenities such as WiFi, plush seating, and a professional driver. 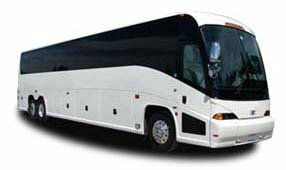 Reserve your own 56-passenger full-sized motorcoach for your large group trip. Ideal for traveling long distances, this bus is equipped with multiple premium amenities to keep you comfortable on your Chicago journey. A professional, experienced driver will safely transport your group around town while you focus on enjoying your trip. An 18-passenger minibus is a great choice for small families traveling through Chicago. Instead of caravaning in multiple cars, let a professional do the driving while you enjoy your time together on a comfortable, spacious minibus. Leave the travel logistics to us on your next Chicago trip! The 20-passenger minibus is a great option for a shuttle service at your Chicago wedding or corporate event. Safely shuttle passengers from their hotels to your ceremony, reception, or corporate convention venue. No matter where you’re headed, we’ll help take the stress out of planning your event with streamlined transportation.